Barba, L.; Durocher, S.; Fraser, R.; Hurtado, F.; Mehrabi , S.; Mondal, D.; Morrison, J.; Skala, M.; Wahid, M.
Barba, L. [et al.]. On k-enclosing objects in a coloured point set. A: Canadian Conference on Computational Geometry. 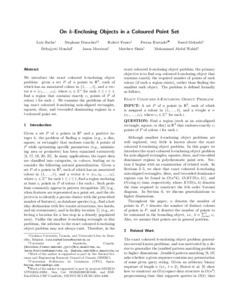 "Proceedings of the 25th Canadian Conference on Computational Geometry". Waterloo: 2014, p. 229-234.